Let KEO Marketing be your resource for up-to-date information about best practices for SEO, mobile, local and social following the latest algorithm updates. 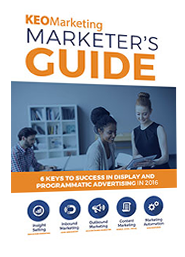 Download our complimentary Marketer’s Guides today. Stay on top of the 2019 marketing trends to keep your business flourishing and ahead of your competitors throughout the year. Generating leads for B2B companies requires a comprehensive roadmap and an integrated strategy. Learn from multiple examples of a proven success formula in action, discovering how numerous B2B organizations combine content marketing tactics with tried-and-true lead generation principles to increase sales. In today’s evolving digital marketing environment, you cannot afford to disregard trends and predictions for digital marketing in 2018. You need to know not only what other marketers are planning, but what digital marketing trends are going to expire in 2018. In today’s evolving digital marketing environment, your website is the hub of your marketing and sales communications. Your website is your brand’s face to the world and, as such, is the most powerful marketing tool you have. You cannot afford to overlook your website in 2019. 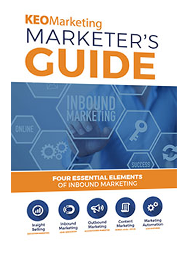 Are you ready to take your inbound marketing efforts to the next level? 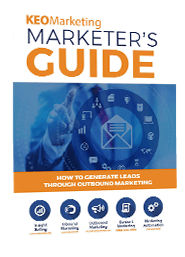 Download our newest guide “Your Guide to Choosing the Right Inbound Marketing Agency” today to jumpstart your inbound marketing program. 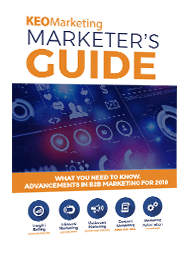 Are you looking to learn more about the latest advancements in B2B marketing to help your business meet or exceed its marketing objectives in 2018? Are you using outbound lead generation? If you are, you know outbound marketing is here to stay. Tested and still true today, outbound strategies help you fill your sales pipeline with valuable leads. Your online presence depends on how your website ranks when people search for your products and services in search engines. If you want better SEO results in 2018, how do you know what to look for in an SEO agency and what to avoid? 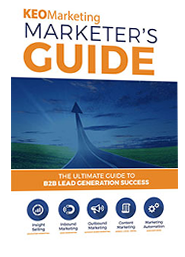 Learn how digital marketing services can help you generate leads and drive your business success in this new Marketer’s guide from KEO Marketing. Based on ever-evolving developments in technology, marketers have numerous options to consider when creating marketing plans and budgets for 2018. Digital marketing and the online world are changing rapidly and drastically. Ignoring the changing landscape can lower the number of leads coming to your website which will ultimately impact your revenue. You love it when customers seek you out, right? That process is called inbound marketing. With the New Year rapidly approaching, it is time for brands to lay out their plans for 2017. Here we will take a look at the hottest digital trends that will impact you the most. Hiring a digital marketing agency is not an easy task and should not be taken lightly. Finding the right agency is critical to meeting your goals and ensuring your marketing budget is being invested in your company to its maximum benefit. 2016 has brought with it a host of new website design tips and ideas. However, website designs tend to be similar to fashion trends; they come and they go. Sometimes the designs are dictated by necessity such as the need to address mobile devices, while other times the designs are created by industry needs or web visitor response. Business-to-business marketers who haven’t yet considered programmatic advertising as a complement to their day-to-day marketing campaign tactics have an opportunity to significantly enhance their digital marketing strategies and deliver even better return on investment. As more business-to-business (B2B) buyers use mobile devices to ​research products and services, a mobile marketing strategy isn’t just a “nice-to-have” anymore​… i​t’s critical to your success​! 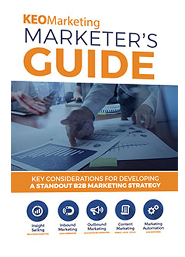 This new ​guide is packed with real-world examples of companies that combine technical proficiency, editorial precision and tactical savvy to reach B2B buyers using mobile devices to research solutions. ​As 2015 comes to a close, seize the opportunity to reflect back on what has and hasn’t worked for you this year–and identify new trends to stay ahead of the pack. To give you a head start, we have compiled a few predictions about where successful marketers will be focused in 2016. Aligning your search and display efforts can maximize ROI and provide for an efficient use of both time and resources. Learn how search has evolved over time, and how combining your search and display strategies can provide the best exposure for every stage of the buying cycle. Do you have a separate mobile version of your website? If so, it might be time for an upgrade. With so many users accessing web content via a wide variety of different devices, it is becoming increasingly urgent that businesses transition their site(s) to a responsive design, ensuring compatibility with any type of device a visitor may be using. Learn more about what the surge in mobile usage means for your marketing strategy, how programmatic advertising (combined with real-time bidding) can help you save time and money, why you should consider paid advertising to promote your marketing content, and what native advertising is, and how it can be used effectively by B2B marketers. Learn more about why secure search was such a major blow to marketers, how better segmentation provides you with more specific data, ways that new features can help with your remarketing efforts , and how a new category can help you prevent one of the things most likely to annoy website visitors. Learn more about Mobile Marketing, tips for incorporating mobile-friendly tactics across all channels, and how Google’s new algorithm affects your mobile tactics. Learn more about Hummingbird, how it affects your SEO and social campaigns, and where you need to focus your efforts in order to achieve the best results from Hummingbird’s formula.